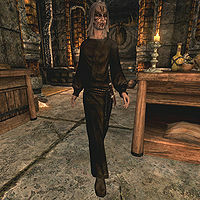 Bothela is a Breton apothecary merchant who lives in Markarth. She owns and runs the Hag's Cure with her assistant and friend Muiri. She expresses regret at the situation of the Forsworn. Odvan in Cidhna Mine is her grandson. Bothela begins her day at 8am when she gets out of her bed to open her shop. She will spend her entire day inside her shop handling customers. After twelve hours of work, she will lock up the shop for the night and head to bed. She will wake up at 8am to repeat her schedule. Bothela wears black mage robes and a pair of boots, and is equipped with an iron dagger. She carries a key to the Hag's Cure and a selection of common loot and gold. She knows a few spells from various schools. From the Conjuration school she knows Conjure Familiar; from the Destruction school she knows Flames; she can use the spell Healing from the Restoration school. Approaching Bothela while her shop is open will have her greet you in a number of ways; one way being to tell you her shop name and mention its reputation for discretion: "The Hag's Cure is here for all your discreet needs..." Bothela will also welcome you by mentioning the variety of services she can provide: "I have potions for disease, love sickness, irritating children..." She will mention her magical abilities as a greeting as well: "A little bit of old Reach magic can cure whatever ills [sic] you...." Bothela may also suggest that you direly need her services with the line: "Oh yes... you'll need one of my special brews..." She will also greet you by making reference to her feared reputation by saying: "Not scared of an old woman now, are you?" On ending a conversation with Bothela, she will offer two unique remarks. One has her once again mention the variety of services she can provide you: "Now you let me know if you need a cure... or anything else." The other will have her tell you that she must get back to work brewing potions: "I have herbs to mix." If you ask her about her opinion of Markarth, she will reply with disgust: "We'd be better off without the Silver-Bloods. They send their brute, Yngvar, to shake some coins from me every few days. And Betrid Silver-Blood is always asking for more potions to fuel Thonar's 'ambitions.' Gives him a temper fiercer than any bear." Asking her if she knows about the Forsworn will result in a sadder reply: "Only that they break an old woman's heart. So many friends, so many kin, all lost trying to rebuild a past that was over long ago." Asking her about her shop's unique name will have her offer you a job to deliver a potion: "Comes with living to a ripe old age, people start thinking there's something magical about you. Then, the insults. Still, a little knowledge of plants and potions can get you by. Not that anyone likes to admit buying things from you. See? I even have a little potion for the Steward. Mind handing it over to him? Just say it should solve that problem he has." Accepting or denying the request will have her say: "Thank you." or "Pity" respectively. Should you initially deny the request, asking her about her shop again will provide you with another chance to take it. If Bothela is killed, Muiri will take over the Hag's Cure and will occasionally make a comment about her late employer: "I've taken over the Hag's Cure, since Bothela is gone." or "I wish Bothela was still running the store. I'm not ready for this." Her grandson Odvan will voice a thought about his grandmother: "I wonder how grandma Bothela is doing. She's probably worried sick about me." 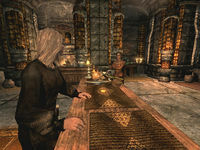 The Markarth City Guard will also talk about her abilities as a healer: "Caught a case of Rockjoint, once. Bothela at the Hag's Cure fixed me right up." Bothela: "No, no girl. It's the picked spider tongue and then the decayed taproot. Do it the other way, and your cure turns into a poison." Muiri: "There's just so much to memorize. How am I supposed to remember what goes where for every single herb?" Bothela: "You will. Until then, you'll taste every potion you make before you sell it." Bothela: "You should be more careful with the man you pick, dear." Muiri: "He said he loved me..."
Bothela: "Real men prove their love. Words are as empty as the air they run through." Bothela: "Stop moping about, girl. Tears won't change what you've done." Muiri: "I was such a fool. How could I let him use me like that?" Bothela: "We all get used, dear. It's living with it that makes you a woman." Muiri: "Bothela, I have a question...."
Bothela: "You want to know a secret of mine, young girl? The most effective poison to kill a man? A potion to make others fall in love, perhaps?" Muiri: "I was actually just wondering if you had any family...."
Bothela: "Oh. Oh, I see...."
Muiri: "I'm sorry. You don't have to tell me if you don't...."
Bothela: "I have one. A nephew. He's in prison for being a member of the Forsworn." Muiri: "I'm sorry, I didn't realize." Bothela: "Don't be. We all make mistakes." Bothela's war paint is unavailable to you. She shares her war paint with Eltrys. The "imprisoned nephew" she may mention in conversation is actually her grandson Odvan. Bothela's corpse will never disappear. Bothela doesn't sleep properly due to a missing package. This page was last modified on 4 June 2017, at 11:45.